A raised American flag, a ship’s whistle and a naval flyover signaled the completion of Saturday’s commissioning of the U.S.S. Thomas Hudner. The event drew a packed house, which included dignitaries such as Gov. Charlie Baker. “Be proud to operate a ship named after such a special man,” Baker told the naval men and women who work on the ship. The event also attracted service members, veterans, family members and friends of Captain Hudner, including former naval officer Jack Kessler of Concord, which is where Hudner lived. The occasion at Boston’s Black Falcon Terminal was also bittersweet as the nation mourned the sudden death of former President George H.W. Bush. Bush attended school with Hudner and Kessler. “They both went to the same prep school. They went to Phillips Academy in Andover where I went,” Kessler said. Hudner received the Medal of Honor for his actions during the Korean War. Hudner tried to rescue his friend and wingman, Jesse Brown, who was the U.S. Navy’s first African American aviator. When Brown’s plane was shot down, Hudner intentionally crash landed his own plane to try to save his friend. Hudner’s son said that is just the kind of person his father was. “While many of us would say that was an extraordinary act, my father never thought of them self or that action is extraordinary,” he said. Brown did not make it out alive, but his granddaughter said Brown’s friendship with Hudner survived intense racial tensions of the time. “Face a lot of discrimination, a lot of tough times but threw that perseverance we have this great story,” Brown’s granddaughter, Jessica Knight Henry, said. Hudner’s legacy and friendship with Brown will now live on through the U.S.S. Hudner. 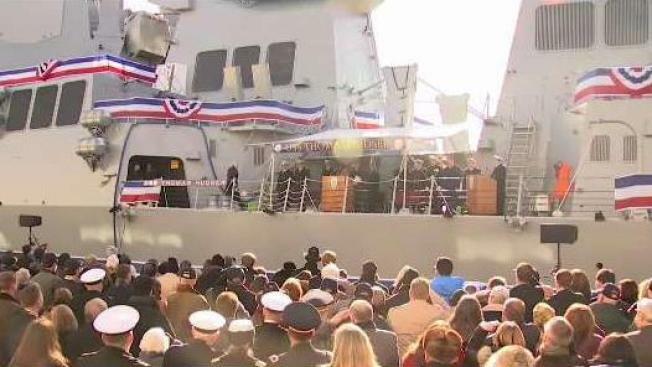 This ship is the U.S. Navy’s newest commissioned warship. It will be homeported in Mayport, Florida, and it will serve in defense of the nation around the world on the open seas.